Welcome to the Acacia Centre in Annesley Woodhouse, Nottinghamshire. 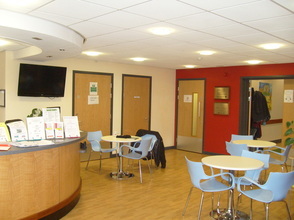 The Centre opened in 2010 as a totally re-furbished Community Centre and is run on behalf of the community by Acacia Centre Ltd (Registered No. 7178885, Charity No. 1156651). Our aim is to become the Community Hub for the local area which provides a state-of-the-art venue for community activities and events. From young to old there is something for everyone – visit our activities page for a full list of regular groups and activities that are held here. Rooms are bookable at competitive rates for community, social, statutory or commercial use, with discounts for block-bookings and package deals for parties available. Buffets to accompany your booking can be catered for on request. A hive of activities that include Arts and Crafts, Information, Bric-a-brac Stalls, Games, Tombola, Bouncy Castle and Music as well as live Acacia Radio coverage and Hot and Cold Food and Drinks to enjoy. An expansive range of activities for adults and children of all ages including Exercise, Health & Wellbeing, Arts & Crafts, as well as clubs for other hobby and interest groups attended and / or run by organisations, community groups and individuals from local communities and beyond. Advancing the education and wellbeing of the public through courses covering Arts & Crafts, Radio and Media, Desktop Publishing, Information and Communication Technology, Leisure, and more. Some courses are accredited to help support professional development. A selection of hot and cold food and drinks at very reasonable prices. Organised by Acacia Radio, these evenings fill the Hall with sounds from a range of music genres performed by bands, solo artists and songwriters. For a fun social evening or/ and to be in the spotlight yourself, get in touch with the Acacia Centre to find out more. Drinks and snacks available. This event is held every two months from January on the last Thursday of the month from 7.30 PM till late. Hosted by its strong presenter-base and broadcasting on 1287 A.M and around the world on the Internet - www.acaciaradio.com, Acacia Radio offers a platform for communicating the Acacia Centre’s activities, social and recreational topics as well an eclectic mix of music. A self-organised group that helps people to look for work by building new contacts, sharing job hunting experiences and ideas, and talking to guest speakers. Stationery, use of equipment and other useful resources are provided. Food Collection Point at the Acacia Centre in support of the Community Food Bank based at St. John's Church Hall, Annesley Woodhouse. All donations are gratefully received, and supplied to the local Food Bank. Being a part of the Acacia Centre brings opportunities for both social and professional involvement which may help on the road to finding employment. We have worked with individuals from Universities, Schools and Job Agencies.